With Group Hex Vol. 2, the Great Lakes Horror Company continues the tradition of terror established with Group Hex Vol. 1. 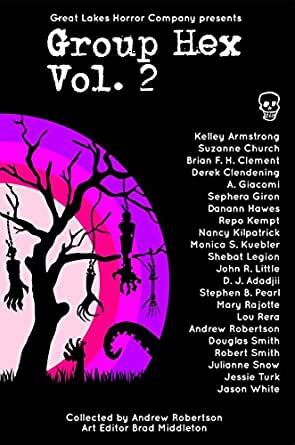 This diverse horror anthology features chilling tales of terror from bestselling authors, cult favourites, bent minds and blood soaked newcomers. Prepare yourself for vengeful spirits, hungry haunted houses, monstrous carnies, diners serving up a side of death, corporate crimes and murderous demons hidden in plain sight. With illustrations by popular and award-winning genre artists and a few possessed souls with a poisoned inkwell, Group Hex Vol. 2 is ready to satisfy those with even the most peculiar tastes. Aramika Kliavin, Arinn Westendorf, Jordan E. Smith, Izzy McCoy, Jen Rec, Brett Bakker, Johnny Larocque, Monster Matt, Dinis Freitas (cover). 5.0 out of 5 starsAWESOME HORROR COLLECTION! This collection by some of the best Canadian horror authors grabs you right from the get go and never lets up. I recommend this awesome collection to anyone who loves the horror genre.